This is Robyn’s first appearance at the New Vic. Theatre credits include: Much Ado About Nothing (Oxford Shakespeare Company); The Snow Queen (Theatr Clwyd/Paperfinch Theatre); Mood Music (Old Vic). 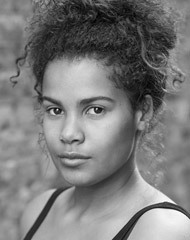 Robyn was part of the National Youth Theatre in 2011 and graduated from Royal Central School of Speech and Drama in 2017.